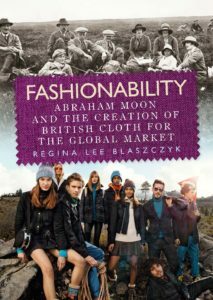 In her new book, Fashionability: Abraham Moon and the creation of British cloth for the global market, Professor Regina Lee Blaszczyk of the University of Leeds examines the Yorkshire tweed business over the past 180 years through the eyes of one firm, Abraham Moon and Sons Ltd of Guiseley in Leeds. This book brings together her interests in consumer society, material culture, design and innovation, and fashion as a business. For the next few weeks, Blaszczyk will use the MUP blog to introduce this book, a “micro history” that uses Yorkshire tweeds as a lens for examining the role of fabrics and fabric design in the international fashion system. The first of these posts starts with the dawning of a new Victoria era, when the dominance of the Yorkshire wool industry was already clearly established. In 1837 in London, a beautiful young Queen named Victoria ascended to the British throne. In the years ahead, Victoria and her husband Prince Albert would set a new tone for Anglo-American culture, celebrating family to the point that strivers on both sides of the Atlantic Ocean looked to domestic life and its trappings as symbols of accomplishment and respectability. The home, furnishings, china and glassware, and articles of personal adornment became important markers of middle-class identity. The consumer revolution of the eighteenth century was updated for Victorian times, and fabrics and fashion played an important role. Dressing the part became evermore important, and the spread of wealth allowed a greater number of consumers to wear clothing that was not only warm and stylish but that helped them make identity statements. That same year near Leeds in the industrial North, two weavers, the half-brothers Abraham Moon and William Moon, set up a partnership to make and sell fabric for the domestic and export markets. The entrepreneurs were hoping to capitalise on the global demand for wool cloth made in West Yorkshire. Their partnership failed in the economic downturn that followed the Panic of 1837, but the Moons were soon back on their feet. Abraham Moon, in particular, developed a reputation for sobriety and industriousness. This experienced weaver spent the next two decades working alongside his wife to make wool shawls for sale to Leeds merchants in the “shipping trade” oriented to overseas markets. By the 1860s, the Moons’ hometown—a small village called Guiseley, which is now part of greater Leeds—was humming with activity. 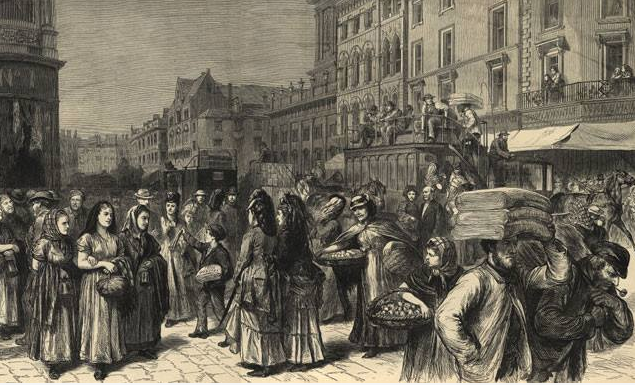 International trade was booming, due to a confluence of circumstances that lowered tariffs and threw open Western markets to British goods. 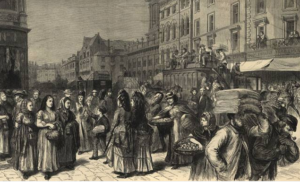 The shipping merchants in Leeds, Manchester, London, and Glasgow clamoured for wool fabrics that could be exported to Europe and North America. The military needed plain durable cloth for uniforms while consumer markets looked to British mills to provide a wide variety of warm and fashionable wool fabrics to be sewn into men’s, women’s, and children’s apparel. The sewing machine had been introduced, and its adoption by manufactories was helping to expand the demand for ready-to-wear clothing. In countries with cold climates (like Germany and parts of the United States), consumers coveted clothing made from British tweeds for their practicality and eye-catching designs. The type and quality of cloth was important. The fabric helped consumers say who they were, and how they fit into Victorian middle-class culture. Men especially relished the look of British tweed, which added texture and visual interest to the suit that was becoming standard for business dress. But British wool cloth was produced in an endless range of colours, textures, patterns, and price points. There was something for every taste. Scottish mills made high-end tweeds for menswear, while the Guiseley weavers developed a speciality in colourful inexpensive tweeds for ladies’ attire. Abraham Moon expanded his business on this boom and climbed the social ladder in his village. By the mid 1860s, Moon was a “clothier” who employed other workers to spin the yarn and weave the cloth that he took to market in Leeds. Victorian fashion looked to be serving Abraham Moon well–until rivals tried to steal his designs. 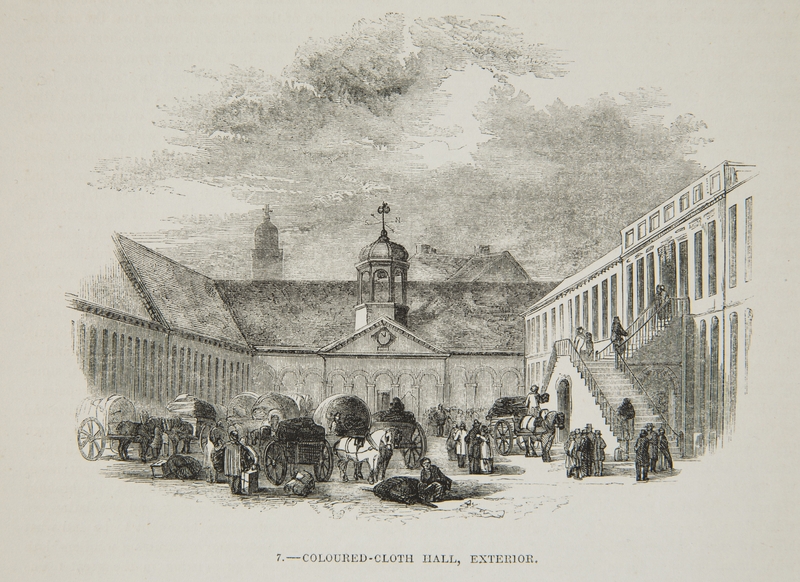 Read more in Blog Two, Industrial espionage: the theft of the grey tweed next week. 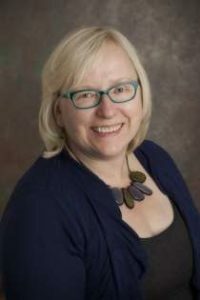 Join Regina Lee Blaszczyk as she talks about “Abraham Moon and Sons of Guiseley and the Creation of British Cloth for the Global Market” at Leeds Central library on Friday 24th November at 1pm. Category: Blog, Fashion	0 Comments.